'Hindrance Became The Power': Passion Pit's Angelakos On Music And Mental Health Due to his own experiences with mental illness, Angelakos has become involved in advocacy — including founding the WishArt Group and donating the royalties from sales of his new album to research. Michael Angelakos of Passion Pit initially exchanged his new album Tremendous Sea of Love for tweets supporting the #weneedscience Twitter campaign. It became available to stream July 28. In February, Angelakos founded the Wishart Group, which aims to provide support services for musicians. One of its priorities is improving mental health services — something Angelakos, who has bipolar disorder, has found particularly lacking in the music business over the course of his career. "If you read any book on the music industry, if you talk to anyone in the music industry, it's like, 'Well, this is just the way it is,'" he tells NPR's Scott Simon. "There's no healthcare. There are no benefits. There's no one taking care [of you]." In March, Angelakos offered free downloads of a new Passion Pit album, Tremendous Sea of Love, in exchange for tweets in support of the #weneedscience Twitter campaign. Four months later, the album was released to streaming services. Angelakos is also donating royalties from the sales of Tremendous Sea of Love to the Stanley Center for Psychiatric Research at Broad Institute of Harvard University and the Massachusetts Institute of Technology. Angelakos joined Scott Simon on Weekend Edition to talk about how his childhood and his mental illness inform his music. Hear the conversation at the audio link, and read an edited transcript below. Scott Simon: How did you find music? 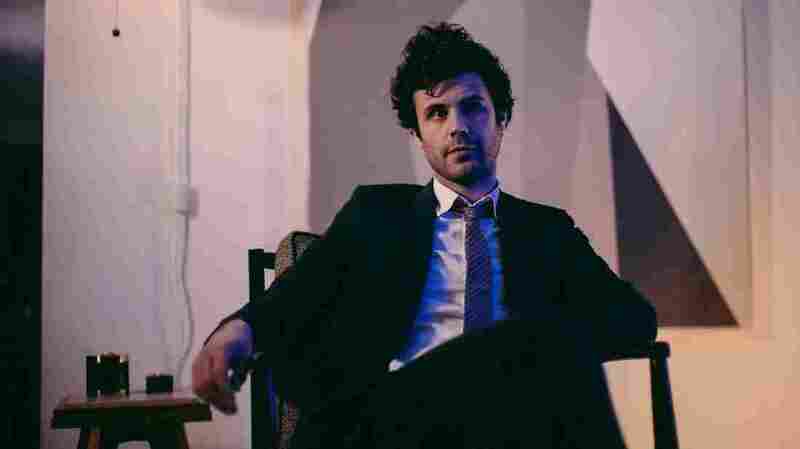 Michael Angelakos: My dad recalls me singing in perfect pitch when he was changing my diapers. My father was a musician [and] a music teacher for 15 years at public schools — when his son suddenly becomes a professional musician, and you were always trying to be a musician — he's not the one who's going to give me that for free. I love my father, I love him to death, but it naturally came to me. [My father] tried to pay for lessons, and I would go to lessons and get my hands slapped because I didn't understand why I needed to learn other people's music when I could just write my own. And I also thought that, with my obsession with The Beach Boys around four or five — I thought they had annual tryouts! To be in The Beach Boys? Yeah, I just wanted to be a Beach Boy, really. I thought I would impress them if I wrote songs. So I was a little bit of a brat, but it was encouraged. My family was very kind about allowing me to sit in my room — I recorded over all my dad's tapes. I wreaked havoc, but at the end of the day they nurtured a songwriter, and that was really all I ever wanted to be. On Tremendous Sea of Love, there's a song called "For Sondra (It Means The World To Me)." May I ask — who's Sondra? Sondra Radvanovsky, the opera singer. I've met a lot of famous people in my life, but one of the only people who made me cry upon meeting them — like just freaking out — was Sondra. Opera was something that I shared with people I'm very close with, that I had to go through a lot with. And something about that night, meeting Sondra and everything, brought the women in my life to a place where — I'm just very grateful to my mother and my wife, my grandmother, all of these people that I just didn't know how to talk about, really. Did this song help you do that -- talk to them? Yeah. You connect it to something, a memory like that — it allows you to access a certain place. I don't know. It's something that I remember thinking, at that time — I was like, I missed everybody. When I met Sondra, I missed everyone. Because at that time, I was blaming lots of people for problems that are just impossible to explain, that are in my head. Well, I have bipolar I disorder, rapid cycling, with anxiety and PTSD. And what I've always been doing with my music, even though at certain points I just denied it flat-out, was just a way of explaining it sonically. I just wanted to hear what it sounded like, what my bipolar disorder sounded like. And it would sound like, to me, I was the underdog winning, or something like that. And that's been my life. It's really just trying to explain and apologize and work through this illogical world in my head that has been like running with weights, but no one can see the weights. And suddenly at a certain point when you've lived through it, that's one thing that I started realizing: the hindrance became the power. The hindrance became the power. I started realizing, as a mental health advocate, that everyone's going to deal with melancholia. Everyone's going to deal with anxiety, grief, so-and-so. But how you walk through them is important, because you could develop something very serious. And I cared deeply. Because when I was sexually molested, what happened [was] I did not go to counselling — and I was 12, 13, 14 years old. What happens when you're in your twenties — these things develop bad behaviors that look like choices, but they become treatments, self-medicating — things that are really, really dangerous. If you read any book on the music industry, if you talk to anyone in the music industry, it's like, 'Well, this is just the way it is.' There's no healthcare. There are no benefits. There's no one taking care [of you]. I don't want to lose sight of your album, because it's good music. Point us to a song you'd like us to hear. A song that I love is "Hey K." A lot of my music has been about my wife, and my life with my disorder and how much we went through. You know, you're a hormonal nightmare as a male in your twenties. [Laughs.] You're going through a lot, on top of having a disorder and having to be the center of attention the whole time, and like — it's a giant miscommunication. At a time when I just couldn't connect, when I was manic — and a lot of people, when you're manic, you really have to quarantine yourself. And so we weren't talking, but just through this music I was able to kind of speak to her and say something along the lines of, "Don't forget that my entire life and everything that I'm doing — all the work I'm doing now — is because I'm also trying to protect you. I'm going to actually try and do something, instead of just talk." Listen to Tremendous Sea of Love at Spotify and Apple Music.